Hello, my name is Hanna van der Zaken and as a therapist and psychologist I am situated in Amsterdam. As you may have found, my main website is in Dutch, but below I have summarized the most important information on my website in English. If you have any questions about therapy in general, my help in particular or about any of the more practical matters such as location or fees I hope you can find it below, but if not, please don't hesitate to contact me. I'd be happy to help! Everyone knows the feeling "I can't cope anymore." Often, it is a temporary feeling that goes away without a problem. But what if this feeling stays, or even gets worse? When you don't function very well and not only you, but also your partner, your family, or your work suffers from your not being well? When you can't do it by yourself and when you regard that as a weakness? In that case it might be helpful to talk to an independent professional about your situation. When to ask for professional help? When you feel that your problems reoccur or increase and you can't resolve them yourself. What kind of questions do you have? A professional can help you answer your questions and help you resolve them, using certain methods and techniques. You will find that all the answers are already within you, but they just were not available when you needed them. Together with the professional, you will set goals and talk about possible ways to achieve them. The sessions will be either on an individual basis, or with your partner, depending on what is considered best. Also, frequency and time in between sessions is determined in the initial consultations as part of the treatment plan. A session takes 1 or an hour and a half, with an average of twelve sessions altogether. Who is Hanna van der Zaken? Hanna van der Zaken (1949) studied the social science "Andragologie"at the University of Amsterdam, specializing in adult education and psychotherapy. Over the next thirty years she became a very well experienced therapist and trainer, including supervision, coaching, group therapy, NLP, Regression Therapy, Body Therapy and hypnosis, Voice Dialogue and Intuition and Energy Development. 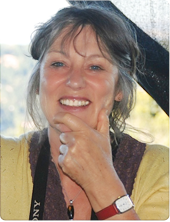 She lived in San Francisco for a number of years and worked as an individual and couples therapist; she now has a private practice in Amsterdam. She also is involved in two mental health institutions, mainly as a group therapist. She is a member of NVPA and RBNG. "I am most fascinated by and interested in helping people to discover and develop their own being, power and qualities and to help them become themselves, to make choices and to enjoy life. I have been doing that for about thirty years, not only as a teacher, psychotherapist and trainer, but also in my personal life. Change is possible, but it requires courage and it is not always fun. You don't become someone else, but by putting things in a different perspective, you can gain great relief, be more in touch with yourself, with your power and therefore feel freer and more in balance - more balance on a physical, emotional, mental and spiritual level. And... it's never too late to change!". What does therapy in Amsterdam costs? A session is E 110,-- an hour, couple sessions are E 150,-- for an hour and a half. When you have additional insurance (aanvullende verzekering) look at "NVPA vergoedingen" for further information aubout possible payment. You don't need a referral from your physician. Where to find the office? Hanna van der Zaken's office is located at the Bart de Ligtstraat 88 in Amsterdam, across from the Amstel Station. It can easily be reached by tram 12, train, bus, metro and car. Parking is available, but please keep in mind that it it's paid parking only.